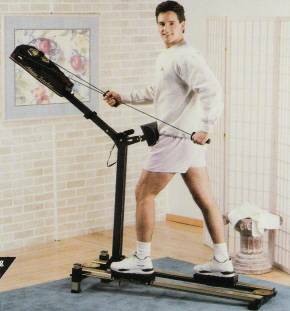 I\'ve used both this skier and Nordictrack and this skier is much easier to use and overall gives a better workout. Most folks that use Nordictrack will tell you it just takes time to get use to it. No such issues with this skier and I\'ve never felt like I was going to fall off like I do when I use a Nordictrack. I used this skier for years until it finally broke down. The skiers being sold by BuyFitness have been sitting around for several years and the wheels fall apart within a couple minutes of use. I tried lubricating the wheels for several days in advance but that didn\'t help. I was told replacement wheels wouldn\'t be arriving for another year or so. As such you should not buy this skier until sometime in 2009 (assuming the wheels have arrived). The skier really is great. Once they get the wheel issue fixed I would strongly recommend buying one.